The Basic Implant Set is designed for all routine surgical procedures where it is necessary to have a surgical protocol that will ensure a satisfactory level of sterility and guarantee the safety of operators and patients. Its moderate cost makes it particularly indicated for all surgical procedures such as second stages, flap surgery and operations on small surgical wounds. 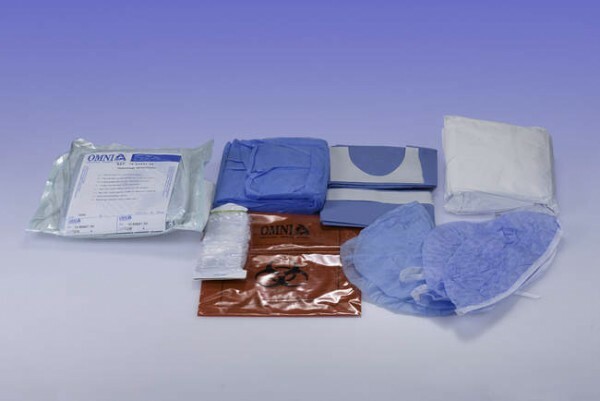 1 Special Plus model gown (size L) with surgical fold and 2 hand towels wrapped in medical grade paper, in light blue SMS Microfibre fabric; 1 Water-repellent gown with cuffs, in light blue NWF; 2 Surgical caps with adjustable ties, in light blue absorbent NWF; 1 Round patient cap in light blue absorbent NWF; 1 Absorbent/waterproof drape 50x75 cm with adhesive side, in light blue NWF+polyethylene; 1 Absorbent/waterproof drape 75x90 cm with adhesive U-shaped split 11x9 cm, in light blue NWF+polyethylene 1 Omnisleeve sheath 120x7 cm, in transparent PVC; 1 Bag for contaminated material, in red PVC.